Düsseldorf – Home of more than 600000 people, home of all cultures, home of the AFEW STORE. The city offers a multi-faceted population, a multicultural population, a cosmopolitan population. The big theme of this collaboration is “HEIMAT” Eng. Home. AFEW are honored to take part in this project. Especially in current times, they want to show and represent a city and a family where every culture is welcome, where everyone lives together peacefully. And the best way to represent your hometown is to show it through your local sports club. 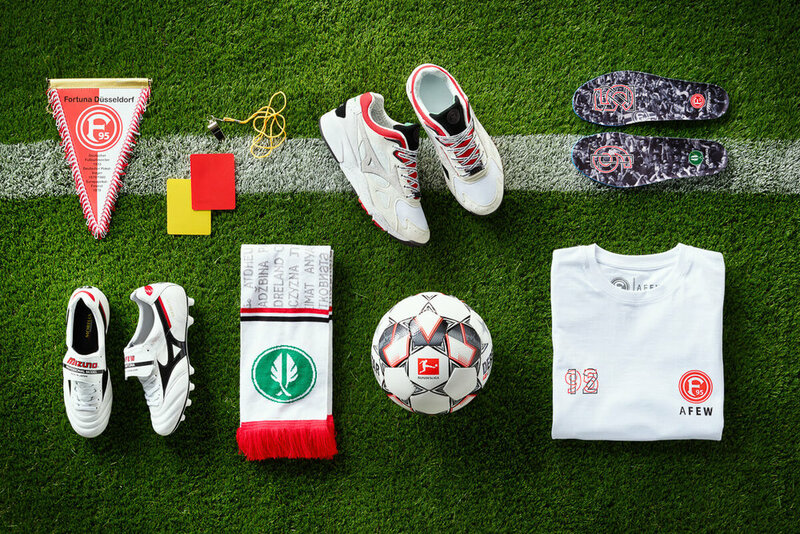 Therefore, AFEW teamed up with the Bundesliga football club Fortuna Düsseldorf and the Japanese sportswear brand Mizuno to design a sneaker, a football boot, a t-shirt and a fan scarf. All of these items have of course the colorway of the football club. To represent a multicultural Düsseldorf and its inhabitants properly, they create a graphic, where “HEIMAT” is written down in more than 30 different languages.